This 3-bedroom villa for up to 6 guests is located in Crikvenica and has a private swimming pool. 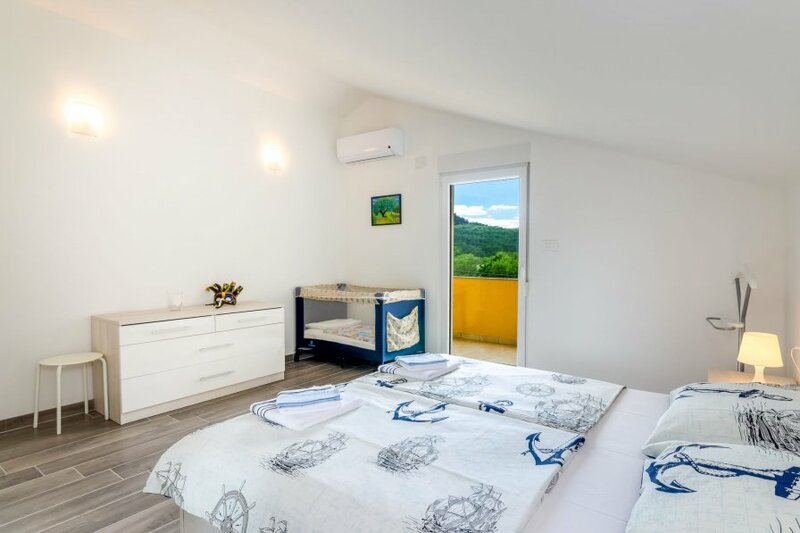 Drivenik: Single-family house Villa Andelika, 2 storeys, renovated in 2018. 9 km from the centre of Crikvenica, in a quiet, sunny, elevated position, 9 km from the sea. Private: property 1'000 m2 with wildlife garden and flowers, swimming pool (25 m2, depth 150 cm, 28.04.-13.10.) with internal staircase and salt-electrolysis pool-cleaning system. Unconventional pool shape. Outdoor shower, pool house with fridge, WC and cooking stove, boules, pergola (20 m2), terrace (150 m2), garden furniture, barbecue, children's playground (swing). In the house: internet access, washing machine. Parking (for 3 cars) at the house on the premises. Shop 850 m, restaurant 9 km, sandy beach 9 km pebble beach 9 km, public bathing area 9 km. Ground floor is closed and not occupied. 4-room house 130 m2 on 2 levels. Living/dining room 70 m2 with satellite TV (flat screen), air conditioning. Exit to the balcony. Open kitchen (oven, dishwasher, 4 ceramic glass hob hotplates, freezer, electric coffee machine). Shower/WC. Upper floor: 2 rooms with sloping ceilings, ceiling height 160 - 265 cm, each room with 1 double bed (2 x 90 cm, length 200 cm), air conditioning. Exit to the balcony. 1 room with sloping ceilings, ceiling height 160 - 265 cm with 1 double bed (2 x 90 cm, length 200 cm), air conditioning. Exit to the balcony. Shower/WC, sep. WC. 2 balconies 12 m2, balcony 3 m2. Balcony furniture, deck chairs. View of the swimming pool. Facilities: safe, children's high chair, baby cot, hair dryer. Internet (WiFi, free). Exit to the balcony 3 m2 (low door height 165 cm).